Ahead of the release of their new EP, Claire Dupree talks sequins, synths and serious subjects with Middlesbrough’s disco rock mentalists Be Quiet. Shout Loud! The date is 29th March 2016. The location, The Green Room at Stockton Calling. It’s nine o’clock, punters have been steady throughout the day but the crowd thickens in anticipation of the next act to play. As stage programmer I’d booked Be Quiet. Shout Loud! myself, but had only heard them on record. As the band stood on stage, adorned by a feather boa and sequins, and began to play their euphoric disco rock, I can honestly say I have never been so pleasantly confounded. 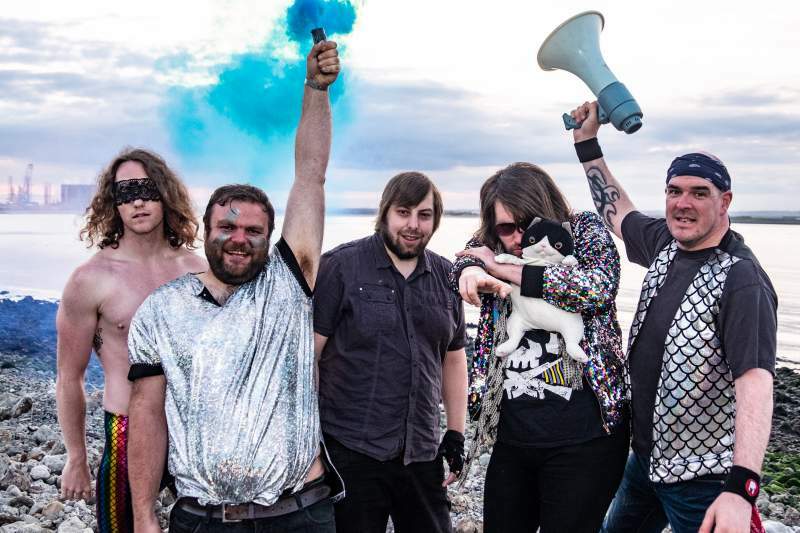 Their videos prove they’re a band unafraid to have a laugh, put on a pout and offer a suggestive wink, but at the same time are totally self-aware and perform without a hint of irony – whether it’s Jake’s eye-wateringly loud t-shirts or axe-man Jamie Donnelly’s foot-on-the-monitor bravado – they even use a keytar…what more do you want?! The band’s forthcoming vinyl EP, Another Commotion, comes ten years since their formation. An album in 2015 and a couple of recent singles have seen them progress from what may be perceived as a throwaway pop act to a force to be reckoned with. From the EP, Louisiana’s an insanely catchy slice of twitchy guitars and blasts of sassy keys courtesy of Chris Burton; the breakneck euphoria of I Just Want You To Know is held in check by Dave Owens’ steady bass rumbles; while Paul Morton’s synthesised beats underpin the sarcasm of Mr Paradise. Then there’s tracks like 2017 single Superheroes’ off-the-wall pop sound, and live favourite (You’re Not) Sitting In Tonight; all well-structured pop songs, showcasing an innate way with melody and rhythm, and note perfect. Be Quiet. Shout Loud! play several shows in October and November – Teesside University at Twisterella Festival (Saturday 13th October); Surf Café, Tynemouth (Saturday 27th October); The Tavern in Blyth (Sunday 28th October); Base Camp, Middlesbrough (Friday 2nd November – official album launch show); Bubbles, Ashington (Thursday 15th November) and Trillians, Newcastle (Wednesday 28th November).